Head of the Laboratory of Protein Physics, Leader of the Theoretical Group; Ph.D., Doctor of Science, Professor, Corresponding Member of the Russian Academy of Sciences. Alexei V. Finkelstein was born 06.16.47 (Kharkov, USSR). Graduated from the Moscow Phys.-Tech. (1970, Honorary Diploma). Ph.D. in Biophysics (Moscow Phys.-Tech., 1976); D.Sc. in Physical & Mathematical Sciences (Moscow University, 1991). Full Professor in Biophysics (since 1997). Since 1970, member of the Laboratory of Protein Physics (headed by Prof. O.B. Ptitsyn) at the Institute of Protein Research, Russian Academy of Sciences. Senior researcher (1980-96). Leading researcher since 1996. Head of the Laboratory of Protein Physics since 1999. Professor of the Moscow University since 1998. 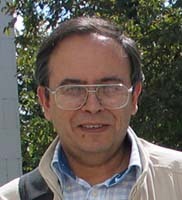 Professor of the Pushchino University (1993-98). Associate Professor of the Moscow Phys.-Tech. (1991-95). Visiting and Research Professor at the Paris-Sud and New York Universities (1994-95). Soros Professor (2001). Awarded the Prize for Outstanding Young Scientists of Moscow Region (1980), the State Stipends for Outstanding Scientists (1994, 1997, 2000) and various Russian and International research grants and awards; the Howard Hughes Medical Institute International Research Scholar (1995-2000, 2001-2005, 2006-2010). Awarded the State Prize of Russia (1999). Elected to the Russian Academy of Sciences (2008). Member of the Editorial Boards of "Journal of Comput. Biol." (USA), "The Open Bioinformatics Journal" (USA), "Chemistry Central Journal" (UK) and "Mol. Biology" (Russia). Member and of the AAAS, of the Protein Society (USA) and of the Biochemical Society (Russia). Author of about 200 scientific papers and a book "Protein Physics", published in Russian, English and Chinese. Protein Physics, Theoretical Investigations of Protein Folding, Molecular Physics, Molecular Biology, Biochemistry, Biocomputing, Protein Design and Engineering. Garbuzinskiy S. A., Ivankov D. N., Bogatyreva N. S. Finkelstein A. V. - «Golden triangle» for protein folding rates. - Proc.Natl. Acad. Sci. USA, 2013, 147-150. Pereyaslavets L.B., Finkelstein A.V. - Development and testing of PFFsol_1, a new polarizable atomic force field for calculation of molecular interactions in implicit water environment. - J. Phys. Chem B, 2012, 116, 4646-4654. Samatova E.N., Melnik B.S., Balobanov V.A., Katina N.S., Dolgikh D.A., Semisotnov G.V., Finkelstein A.V., Bychkova V.E. - Folding intermediate and folding nucleus for I N and U N transitions in apomyoglobin: different contributions of conserved and non-conserved residues. - Biophys. J., 2010, 98, 1694-1702. Ivankov D.N., Finkelstein A.V. - Prediction of protein folding rates from the amino-acid sequence-predicted secondary structure. - Proc. Natl. Acad. Sci. USA, 2004, 101:8942-8944. Ivankov D.N., Garbuzynskiy S.O., E. Alm E., Plaxco K.W., Baker D., Finkelstein A.V. - Contact Order Revisited: Influence of protein size on the folding rate. - Protein Science, 2003, 12: 2057-2062. Galzitskaya O.V., Ivankov D.N., Finkelstein A.V. - Folding nuclei in proteins - FEBS Letters, 2001, 489: 113-118. Mirny L.A., Finkelstein A.V., Shakhnovich E.I. - Statistical significance of protein structure prediction by threading. Proc. Natl. Acad. Sci. USA, 2000, 97: 9978-9983. Reva B.A., Skolnick J., Finkelstein A.V. - Averaging of interaction energies over homologs improves protein fold recognition in gapless threading. - Proteins, 1999, 35: 353-359. Galzitskaya O.V., Finkelstein A.V. - A theoretical search for folding/unfolding nuclei in three-dimensional protein structures. - Proc. Natl. Acad. Sci. USA, 1999, 96: 11299-11304. Finkelstein A.V. - 3D Protein Folds: Homologs against errors - a simple estimate based on the random energy model. - Phys. Rev. Lett., 1998, 80: 4823-4825. Finkelstein A.V. - Protein structure: what is possible to predict now. - Curr. Opin. Struct. Biol., 1997, 7: 60-71. Finkelstein A.V., Badretdinov A.Ya. - Rate of protein folding near the point of thermodynamic equilibrium between the coil and the most stable chain fold. - Folding & Design, 1997, 2: 115-121. Finkelstein, A.V., Badretdinov, A.Ya., Gutin, A.M. - Why do protein architectures have a Boltzmann-like statistics? - Proteins, 23: 142-150, 1995. Fedorov A.N., Dolgikh D.A., Chemeris V.V., Chernov B.K., Finkelstein A.V., Schulga A.A., Alakhov Yu.B., Kirpichnikov M.P., Ptitsyn O.B. - De novo design, synthesis and study of albebetin, a polypeptide with a predetermined three-dimensional structure. Probing the structure at the nanogram level. - J. Mol. Biol., 1992, 225: 927-931. Finkelstein A.V., Reva B.A. - Search for the most stable folds of protein chains. - Nature, 1991, 351: 497-499. Finkelstein A.V., Badretdinov A.Yu., Ptitsyn O.B. - Short alpha-helix stability. - Nature, 1990, 345: 300-300. Chothia C., Finkelstein A.V. - The classification and origins of protein folding patterns. - Ann. Rev. Biochem., 1990, 59: 1007-1039. Shakhnovich E.I., Finkelstein A.V. - Theory of cooperative transitions in protein molecules. - Biopolymers, 1989, 28: 1667-1694. Murzin A.G., Finkelstein A.V. - General architecture of alpha-helical globule. - J. Mol. Biol., 1988, 204: 749-770. Ptitsyn O.B., Finkelstein A.V. - Why do globular proteins fit a limited set of folding patterns? - Progr. Biophys. and Mol. Biol., 1987, 171-190. Ptitsyn O.B., Finkelstein A.V. - Theory of protein secondary structure and algorithm of its prediction. - Biopolymers, 1983, 22: 15-25. Ptitsyn O.B., Finkelstein A.V. - Similarities of protein topologies: evolutionary divergence, functional convergence or principles of folding? - Quart. Rev. Biophys., 1980, 13: 339-386. Schulz G.E., Barry C.D., Friedman J., Chou P.Y., Fasman G.D., Finkelstein A.V., Lim V.I., Ptitsyn O.B., Kabat E.A., Wu T.T., Levitt M., Robson B., Nagano K. - Comparison of predicted and experimentally determined secondary structure of adenilate kinase. - Nature, 1974, 250: 140-142.